In brine salted cheeses, the difference in osmotic pressure between the (often saturated) brine and the cheese aqueous phase is the driving force for NaCl migration. Diffusion of brine into cheese is an impeded diffusion process (Na+ and Cl- ions must migrate around fat globules and the hydrated casein matrix of cheese). Concentration gradient. Uptake increases as brine concentration increases from 5-25% (w/w) NaCl. Salting time. Uptake increases but at a diminishing rate with salting time. Brine temperature. Uptake increases as brine temperature increases from 5 to 20 C. There is a minimum temperature for uptake at ~32C as fat exudes at the cheese surface (above this temperature fat is more liquid and is lost more easily). Surface area:volume ratio of the cheeses. Salt uptake increases with increasing surface area:volume ratio. Moisture content of the curd. Rate of NaCl uptake increases as curd moisture increases. Fat content of the curd. Increasing fat tends to impede diffusion. Curd pH. Uptake decreases as pH increases from 4.7 to 5.7. This effect is caused by increased charge on the caseins as one moves away from their isoelectric point causing greater hydration of the protein and thus tending to impede diffusion. 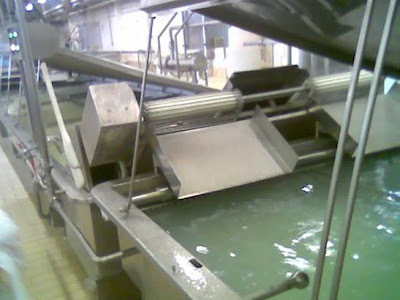 Photo shows an industrial brine bath used to brine Mozzarella-type cheeses moulded into fist-sized pieces.